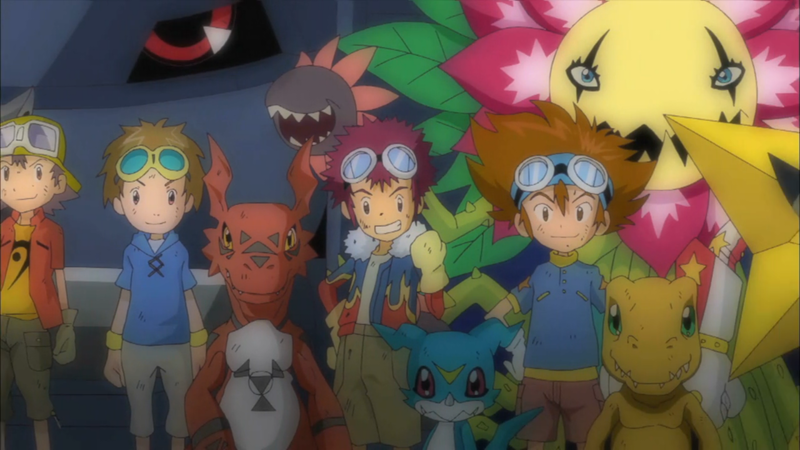 In this episode, we wrap up the sad little appendix of Digimon Xros Wars. Because it's not like there's anything else going on in the franchise right now. Digimon Xros Wars: The Young Hunters Who Leapt Through Time is universally derided as the black sheep of the Digimon franchise. You won't find any argument here. It's not the worst thing for the franchise to have, to be honest. Arguing about the best season is fun, as we can break down the best qualities of every season and realize just how lucky we are to have such a range of experiences and adventures. Talking about the worst is typically annoying as too many seasons are dismissed for entirely superficial reasons. Better to have a clear answer to pick on. It's a shame the show insists on considering Hunters part of the Xros Wars series. It's a different season, perhaps (Xros Wars is the only series delineating itself so clearly), but it has no business being treated as episodes 55-79. Judge the first 54 episodes and you're making favorable comparisons to Adventure and Savers. Tack on the last 25 and the final GPA is only a notch above Zero Two. Even if it were good, the altered setting, new rules and character shift would call for it to be viewed independently. None of those are deal breakers on their own. With enough elaboration, the concept of DigiQuartz could be intimidating. It's set up to have the best mystery element of any story, and it would have been a hell of a ride watching Taiki and Yuu unravel the clues slowly over the entire season instead of the big drop in the final few episodes. Imagine them exposing and revealing Quartzmon rather than having the enemy appear randomly. Imagine them having to actually deal with the ramifications of the clockmaker's true identity... and the implications of the other legendary heroes working for him. Either way, Tagiru remains a problematic character. He's selfish, obnoxious, and looks out for himself more than his friends or even the entire world's well-being. Despite having no discernible skills and possibly no real friends, he feels entitled to be the star of the show, with shockingly little getting in his way throughout the course of the series. Even this can be twisted around easily. If Taiki's friendship was a ruse to keep him in line. If the legendary heroes dismissed him as being unqualified and aren't willing to let him try raising the Brave Snatcher. If Tagiru ever came to the conclusion that his own personal glory had to be sacrificed for the good of the world. There are eleven moments when Yuu absolutely should have punched Tagiru in the face. If that doesn't sound like a lot, try counting times Takeru should have punched Daisuke. In twice as many episodes it won't be half as much. Worse yet, Tagiru forced other, more interesting, characters to take a back seat. Taiki, as the senpai of the group, was excellent when called upon but often seemed disinterested in the day-to-day crises. Let's have a slow arc watching him come to terms with being one of the six legendary heroes. Yuu starts out in a truly sad place, which not only is never explored, he overcomes it on his own time. Ryouma, Ren and Airu are neat ideas, but it becomes clear early on that nobody really knew where they wanted to take these characters, leaving them uncommitted to any specific role. Elevating these other five and emphasizing an ensemble cast would have been another step to make the season better. For the longest time, this looked like the end of the road. A sorry way to go out, perhaps, but the crossover at the end generated an unprecedented level of excitement as fans across the globe tuned back in to see their old favorites fight one more battle. It was the first time Digimon had ever trended on social media; social media being a foreign concept in the show's heyday... and certainly ripe for a Digital World allegory. Just as System Restore wraps up the entirety of the Digimon anime, it returns to us, generating that same excitement for the same reasons. Thankfully Digimon Adventure tri. is shaping up to be a far more worthy effort... that we'll start breaking down Thursday. As always, thank you for reading, thank you for the comments, and especially thank you for using our Amazon marketplace (we get a small cut of any purchase you make through that link). All of those helped make the Hunters slog far more tolerable than it had any right to be. Also, I now have a side account on Twitter for random thoughts, conversations, and announcements for postings here and related to my fanfiction (which will resume once I finish reviewing tri.). You guys are the real superstars. "There are eleven moments when Yuu absolutely should have punched Tagiru in the face." You're doing such a great job A.R! I've been following the blog for a few years now, and it's been so enlightening to realise just how much Digimon shaped my film and TV interests, and overall identity. Thanks!!! Ah well, at least we have the rest of Fusion, one part on par with Tamers, the whole on par with Data Squad. Fanon Discontinuity is everyone's friend here: Hunters can be safely ignored. Still, what a train crash this is that comes after the ambition and heart of the Death Generals half. Calling it the "third half" is entirely appropriate: unnecessary, unwanted, and unrewarding. At times, it's almost like it was built to irritate fans of Fusion, teasing them with old favourites and potential character arcs, and then having them all orbit the one human character least deserving of attention. At least Gumdramon had some depth and actual character progression (admittedly slight and disjointed), and we can enjoy watching old favourites pummel a Vamdemon army to oblivion. the code not fial mmmmm.